Find My Workspace lists over 95% of the serviced offices market in Geneva. Simply click Request Quote to check pricing for one office, or Add to Basket for multiple offices. Our building is connected by permanent Internet connection at very high speed or by WIFI network. In a pleasant and easy-to-access environment, we offer a choice of offices, meeting rooms and tailored services for your company. All our spaces are comfortable, bright and air conditioned. Private and secure parking spaces are available. 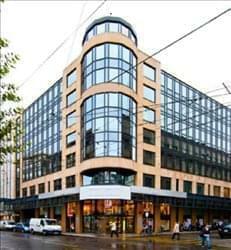 This business centre situated in a prime area of Geneva offers bright, modern office space within a 6-storey building. Offices here are fully serviced and customisable, with furniture, layout and decorations of your choosing, along with flexible terms and all-inclusive fee to make sure you have no hidden fees at the end of the month. 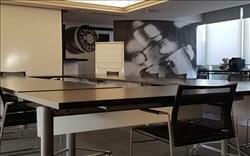 The meeting rooms are modern, stylish and offer 360° view of the Jura mountains. This space offers a perfect base for start-up companies or growing business as there is a friendly on-site management and reception team who will give an impressive welcome to any visitors and help your business thrive. On top of all of this You will never pay for more space than you need, as you can simply add work stations when required. This centre is situated in a modern landmark six-storey building , offering outstanding views onto the surrounding mountains. Offering lounge areas, secure underground parking, dry cleaning services and gym facilities, the centre also provides disabled facilities and an on-site lunch restaurant. 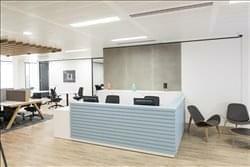 Office space for rent in a newly and very tastefully renovated floor, in a building owned by a bank. 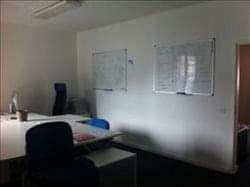 This is very bright space, with use of common spaces and an extensive conference room. The office changes its paintings every 6 months and a opening exposition is done with presence of the Artist. This modern business centre boasts outstanding views of the surrounding area and mountains, and has high-quality office accommodation available to let. Serviced offices and workstations are offered on flexible terms within this wonderful bright and open working environment. All workspace is fully furnished for your convenience and tenants will benefit from the use of on-site meeting room, car parking and kitchen equipped with refrigerator, microwave, Nespresso machine and toaster. Situated in the centre of a brand new urban development in Geneva, this business complex aims to create a modern workspace for businesses. Whether you are a freelancer, new entrepreneur or established business, this work space will provide you with the perfect space to suit you. A range of offices are on offer including private offices, coworking spaces and virtual office options. The term offered are flexible and affordable. You will also benefit from high speed internet connection, 24 hour building access and a range of in-house amenities. This vibrant centre does not only offer you stylish work spaces but also highly functionality so your business can thrive. The centre offers professionals a place to work without interruption and a business lounge for business travellers to catch up on emails, calls and meet in a professional environment. Geneva is a global centre for finance and diplomacy with many private banks and international organisations, including global corporate HQs ranging from shipping to technology. Occupying seven floors of a fully renovated and low energy consumption building, this professional business centre is the ideal place for your new offices. Offering private executive suites, open-plan office space, co-working areas and virtual office options, there is a solution to any unique requirement that you may have. There are also great on-site facilities including a business club, meeting rooms, a business lounge and a refresh area, all of which are ideal for relaxed team meetings as well as a great way of networking with other professionals who also reside within the centre. Whether you need your own private office space fully equipped (or not), a 120-square-metre conference room or just an attractive drop-in open workplace, this could be the ideal place for you. Starting CHF 9 per hour for the coworking space. This centre can accommodate a large number of different working styles and preferences to suit your particular needs. You can focus on your core business; the centre take care of all the logistics. It’s good to be at work! This centre offers modern offices available on a number of different lease terms. Various support services are available on an as-needed basis as well as meeting rooms and conference suites. Close to the highway exit and 15 minutes from the airport and citiy centre. This completely renovated building provides ceiling-to-floor windows in all the offices for maximum natural light, as well as door-front parking, a lounge and a large outdoor terrace. The lounge and terrace can be rented for private events. The building is accessible 24/7 through security badges. There is also a 24/7 cafeteria with coffee, tea, still and sparkling water, soft drinks and snacks, as well as a fully-equipped kitchen open to people in the building. There is a shopping centre, fitness centre and restaurants close by. It is also an easy drive or bus/tram ride away from the city centre, which is located 3.5 km away. Serviced offices come in three sizes, according to availability: 24m2, 48m2 and 60m2. Located in a vibrant industrial area of Geneva, this business centre is well situated in a prime location. It stands just 1-minute away from a bus stop, shopping centre and 5-minutes away from the picturesque neighbourhood of Carouge. The space offers flexible memberships, from daily passes to serviced offices, passing through shared and dedicated desks, so you can set up your business under the conditions that suit you. Other Amenities include Wi-Fi access, printers, meeting rooms and a well designed lounge in which you can network with likeminded individuals. There is a kitchen and unlimited tea & coffee for your convenience. This new Business center is located in a 5 floor character building at street corner, renovated and fully rehabilitated. This building is In the city center close to all services facilities and easy to reach from the train station 10 minutes away. With beautiful natural light on all floors and a listed Art Déco staircase, this centre has kept some stunning original features while providing modern facilities. There are also 2 elevators and a daily cleaning service. This stylish business centre is situated in the vibrant Charmilles district, providing furnished office-space solutions available on flexible terms. Amenities at your disposal include equipped meeting rooms, high-speed internet, conferencing facilities and customer parking. All work-spaces maintain great levels of natural light as well, creating a positive atmosphere for all tenants. Additionally, the centre is accessible 24-hours a day which allows workers to choose working schedules that suit individual needs. There is also disabled access facilities for those who require them. Fresh beverages are provided throughout the day as well. This centre offers comfortable, well-equipped workspaces with dedicated support teams offering administrative assistance. You will have great networking opportunities with like-minded professionals. Take advantage of the great facilities like a business lounge and videoconferencing centre, that will allow you to convene international meetings from a comfortable, well designed space. Here, your business will also benefit from the centre’s 24 hour access, reception services and high-speed shared internet with friendly IT support at your disposal to keep you well connected throughout your operations. This modern business centre is located in Geneva and provides furnished office-space solutions at affordable rates. All work-spaces maintain good levels of natural light and are available to let on flexible terms. Here, it is possible to take advantage of the high-speed internet, conferencing suites, beverages and customer parking. There are also equipped meeting rooms available to book for collaborative purposes. Additionally, the centre is accessible 24-hours a day, enabling tenants to choose working rotas that suit their business needs. There are also 39 different plant varieties which complement the simple architecture of the building. This center occupies a prestigious address. Housed in a neo-classical style building overlooking Lake Geneva, it lies in a prime location in the very centre of the city. As such, transport links are both comprehensive and excellent. This centre offers lounge areas and an on-site lunch restaurant. To obtain information for your selected Geneva Serviced Offices, please tick the "Add to basket" box for each office you prefer and complete the form below. We will then send a detailed report via email.